We decorated our Christmas tree this past weekend, and had *Aftelier Perfumes’ Blood Orange, Ginger & Blood Cedarwood candle filling the air with a fragrance that will now forever remind me of this special family tradition. As you might guess from its name, this candle is a piquant blend of orange, ginger and cedarwood that is effortlessly intertwined yet allows for moments when the individual essences shine on their own. Aftelier’s perfumed candles are made with beeswax and the finest of natural essences. I wasn’t too sure what to expect in terms of throw, but its festive redolence suffused my rather large living room which admittedly was unexpected and very much appreciated. I’ve got it burning right beside me at this moment, and am contemplating an online Aftlelier shopping trip as there are four other candles to try. Since they are limited edition, you might want to check them our sooner than later. I’m ready to hit the button on Resurrection. With notes of frankincense, vetiver, clary sage, geranium, bitter orange, fir needle, and lime, it sounds like an ideal scent for unwinding during the bustling holiday season. I’ve written a couple times about Olive & Oud, my absolute favorite place to buy soaps. Laura Natusch, the creator of these divine bars, always has inspired blends with essences like cardamom, bitter orange, ginger, clove, vanilla-like Peru Balsam, amyris, nutmeg, and black pepper. Actually, those are the notes for the above soap, Spiced Chai, my current favorite from Laura. Like the Aftelier candle, Spiced Chai is teeming with ginger and orange, but also has a liberal dose of cardamom and clove which make for warm and spicy suds. I like to say that Olive & Oud is a perfumista’s place for soap, and I really do mean that. Laura is currently sold out of Spiced Chai, but she is always making new batches, so please contact her via etsy or Facebook if you are interested. As of today, Bed of Spice, which is similar to Spiced Chai, and another one of my favorites, Cocoa Butter Mint are both available. If it wasn’t already apparent, I love citrus scents this time of year. And what better way to relish the citrus than in another winter favorite, body oil! One of my very first posts was on Jo Wood’s Amka. That was nearly three years ago, but it continues to be a treat for my skin and nose that I reach for again and again. Amka possesses a great deal of sparkling citrus. Orange oil, bergamot, petitgrain, and mandarin oil abound in Amka, but are grounded by an incredibly smooth cedarwood. This counterbalance between vibrancy and tranquility is perfectly achieved in this fragrance and I still enjoy its soothing hydration and restorative scent after a warm bath before bedtime. Aftelier Perfumes’ Blood Orange, Ginger & Blood Cedarwood candle is available at Aftelier.com for $50. *This was a collaboration with Nikki Sherritt of Gabriel’s Aunt. Jo Wood Amka Bath Oil is available at BeautyHabit for $100 for 100ml. Please note: this is different from the body oil I reviewed. It looks like the Body Oil might have been discontinued. 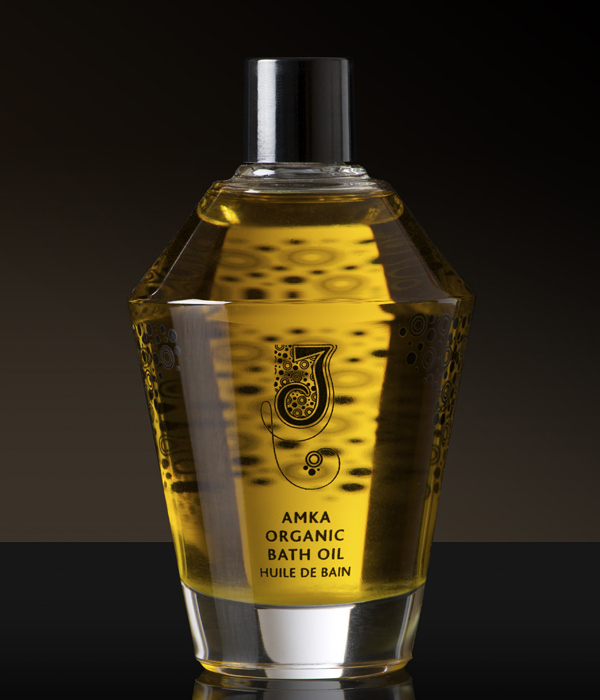 Please see Beauyhabit for the Amka Bath Oil and the EDT which I also adore. Photo of Aftelier candle and the Christmas Tree are mine. Products reviewed in this post are from my own collection. Thank you so much Trish! I love your review and really appreciate your writing about me. Your tree looks terrific, and I’m honored to be part of your holidays! Trish, I can almost smell the scents wafting through my screen. 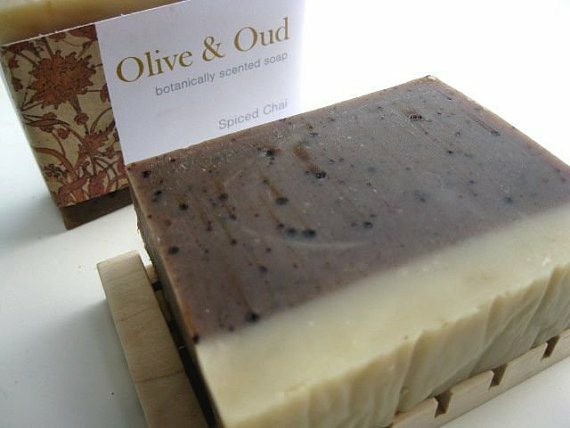 Olive & Oud’s soaps are amazing, and I too love spicy scents this time of year. Happy Holidays! Doesn’t Laura do such a fantastic job with her soap creations? I just love them. I haven’t bought a bar of soap from anywhere else for at least a year. Thank you so, so much, Trish and Scentual Soundtracks! (I can’t believe I didn’t see this until now.) I’m excited and honored. And I have a few bars left of Spiced Chai, so I listed them for your readers. This is my first visit here – a beautiful, write-up, Trish, very sensual in it’s own right, as the best writing about food and scent generally is. I’ve been hooked on Laura’s soaps and products for nearly two years, for the very reasons you mention. I’m using the butter mint now (wow) with two other fragrances at the ready. (I do think of her soaps as fragrances, rather than merely “soaps”.) I also recommend her deodorant (gentle, no aluminum or chemicals, and it really does work as the label promises), her lip balm…everything I’ve tried, actually.